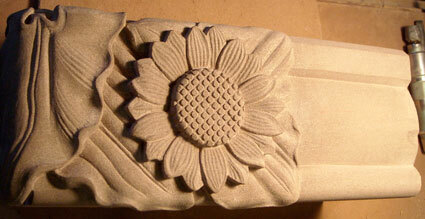 I've enjoyed success in other venues as an instructor of stone carving and I've decided to bring it on home to my studio. From the beginner to the journeyman, I can provide a small intimate environment of intense study. It takes a long time to fully master this demanding craft but with the foundation of basic technique I can provide it will only take practice and time to grow into your skill level. It's just as important for me to tell you what not to do as what to do. I've seen bad habits ruin students chances of getting very far and frustrate them into quitting before they can begin to enjoy the satisfaction of real achievement. I teach by demonstration. The beginner learns how to remove stone from stone while protecting the eventual product by watching me do it. We progress at their speed of absorption from there to the more advanced arena. Eventually students will learn the basics of geometric carving as practiced in architectural carving as well as learning how to work from a sculptural model. You almost never see traditional technique taught in art schools. I can't think of any. That's probably why there is such a lack of qualified stone carvers in this country. I went to art school and we were handed the tools and told to go find our way of expression and that was it. Had I not stumbled into the industrial environment at the Vermont Marble Company, I'd probably be painting water colors today. This is why I feel an obligation to teach; I want to keep the real craft alive.